It may be the world's most powerful VR card, at least until Nvidia catches up again. Let the virtual reality GPU wars begin. 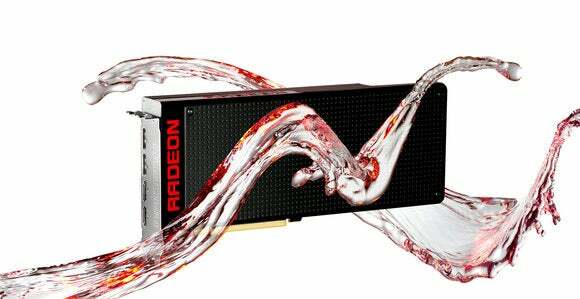 AMD on Monday officially unwrapped a liquid-cooled, dual-GPU card called the Radeon Pro Duo that it says is the most powerful VR GPU today. 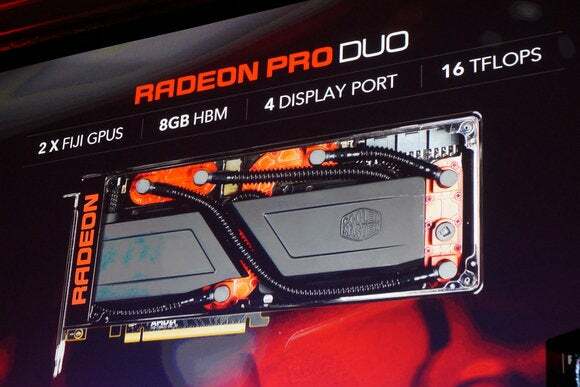 The Radeon Pro Duo is essentially two of its Radeon R9 Fury X GPUs shoehorned into the same card. The company said the price of the card is anticipated to be $1,500. Before you choke on your Hot Pockets, know that’s actually the same price as AMD’s last dual-GPU card, the Radeon R9 295 X2, at launch. And that was actually considered a bargain compared to Nvidia’s dual-GPU GeForce Titan Z, which cost $3,000. 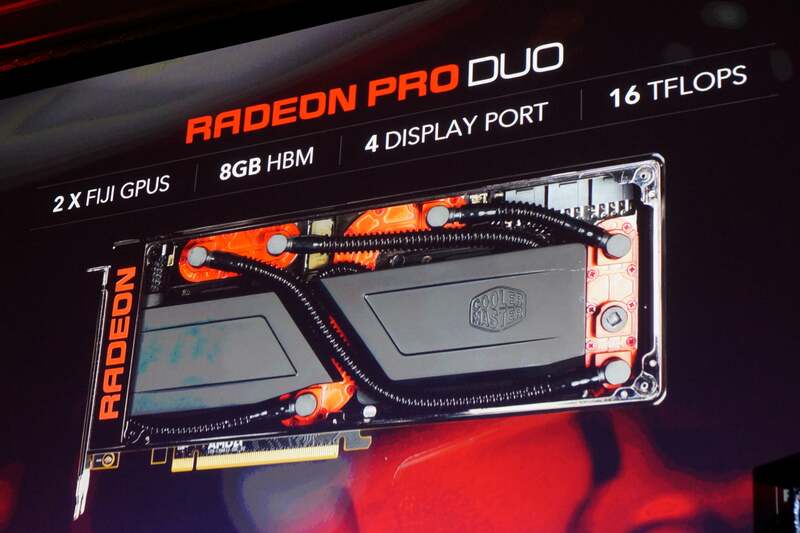 The new Radeon Pro Duo is longer than a standard Fury X. But you may have some time to save up. AMD already delayed this card from launching late last year, and all it will promise now is a “planned” launch for the second quarter. Why this matters: Virtual reality and PC gaming have a never-ending need for more graphics performance, and the company with the most powerful toys usually ends up winning. 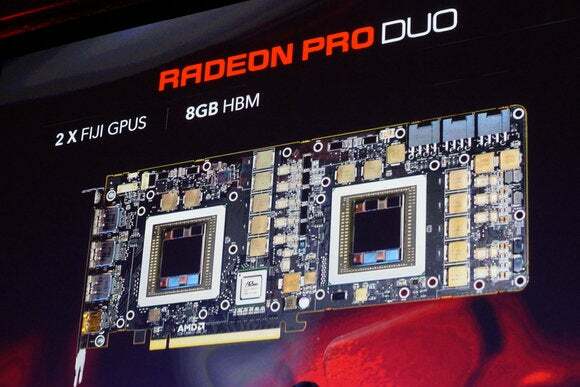 Although late, AMD’s new Radeon Pro Duo is expected to put AMD in front of Nvidia in the performance game. Full Radeon Pro Duo details, such as the size and clock speed, weren’t available before AMD’s announcement, but it appears to feature a single 120mm radiator and will require three 8-pin power plugs to run. 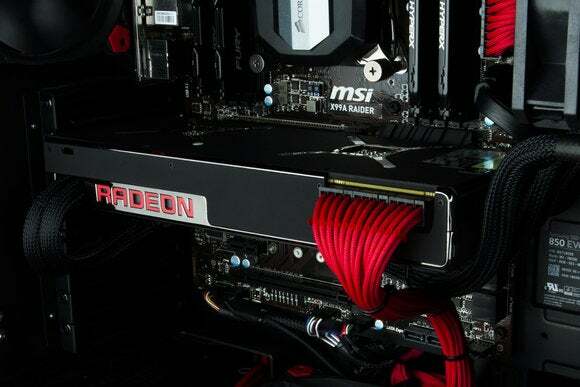 Here’s a close-up of a photo AMD released prior to its press event Monday. It shows the power needs of the card clearly. The new Radeon Pro Duo runs on three 8-pin power plugs. A standard Fury X requires two 8-pin plugs, and the original prototype board for the dual card (shown last June) also appeared to run on two plugs. This final dual-Fiji card’s use of three 8-pins implies up to 450 watts of power consumption, plus the PCIe slot’s dedicated 75W of power. That seems to imply that if AMD decided to downclock the GPUs in the card (which is typical in dual GPUs), it may not be downclocked much. 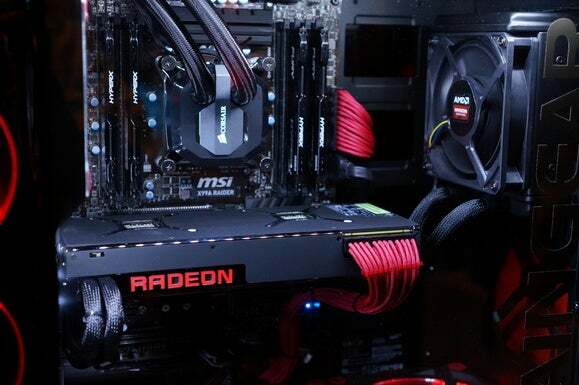 Update: Speaking with AMD officials at the launch, power consumption was very much on the mind of the company, but the card uses far less than the three plugs can supply. Officials told me the card actually has a TDP rating of just 350 watts but it built in the third power plug for overhead for those who want to overclock. 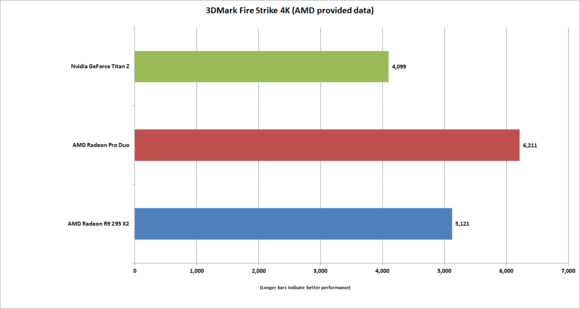 If a single Fury X eats 275 watts, how can AMD pull this off? The card is actually more similar to a dual Fury Nano. It has the full shader stack as a Fury X, but using the company’s PowerTune technology, it dynamically adjusts clocks for a given power and thermal envelope. That’s why the card eats 350 watts, which is twice the 175 watts a Fury Nano consumes. How much has changed in a year? Quite a bit. 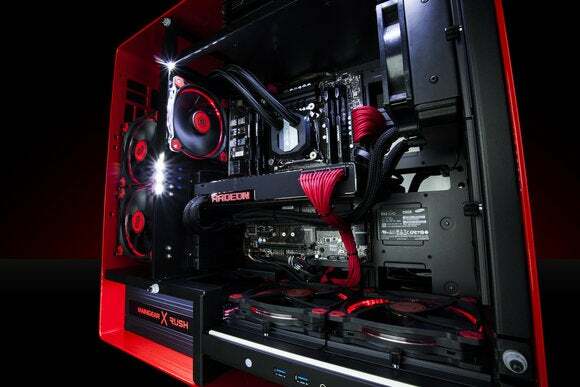 Here’s the prototype card showed off last year at E3 that was snapped by Anandtech.com. 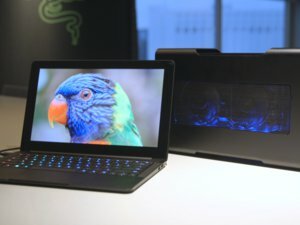 This shot grabbed by Anandtech.com shows the 9-inch PCB dual Fiji board used in the Project Quantum. And here’s the PCB inside the the Radeon Pro Duo that AMD showed off briefly during its Capsaicin event. Note the additional power plugs and how they’ve been relocated. It looks like the voltage circuits in general were relocated, too. The size of the card also looks slightly larger, but it’s hard to judge from a single image that flashed on the screen for one second. Here’s the bare PCB of the new Radeon Pro Duo. Similar but different from the prototype board showed off last June at E3. One thing we do know is that, like the Fury X, the card is liquid-cooled. I’m going to imagine the cooler AMD uses this time won’t run into the same legal issues as the Fury X did. With that card, the manufacturer of the cooler, Cooler Master, was sued by Asetek. Asetek then dragged AMD into its fight by seeking an injunction on sales of the Fury X. AMD won’t want to repeat that mess. Despite the lawsuit, AMD looks to be sticking by Cooler Master’s side. You can see the water blocks clamped onto the GPU dies as well as the covering the voltage regulation modules. Despite the lawsuit by Asetek against Cooler Master, it looks like the liquid cooling vendor for the new Radeon Pro Duo is same as the Fury X. And here’s a shot of the actual card installed inside a beautiful Main Gear machine built for the announcement. Despite packing two GPUs instead of one, the Radeon Pro Duo will use a similar single 120mm radiator. Given the card’s two Fiji GPUs, it’s safe to assume a doubling of the Fury X specs. That means 4GB of HBM memory and 4,096 stream processors in each package, for a total of 8GB of HBM RAM and 8,192 stream processors. 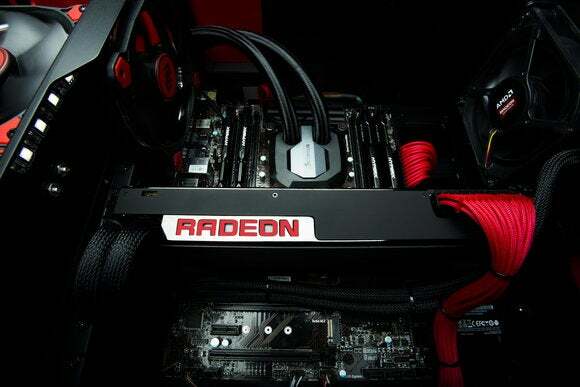 AMD is aiming the card at prosumers and although it doesn’t get the full OpenGL software support that an expensive FireGL would, the company said it tears up the performance in 3D Studio Max and “straddles” the line between consumer cards and professional cards. Its benchmarks used an Intel Core i7-5960X rig with 16GB of RAM and Windows 10, plus the latest drivers for a GeForce GTX Titan Z and its own Radeon 295 X2. Take these numbers with a grain of salt, but compared to the last generation of dual-GPU cards, it looks promising. This is how the Radeon Duo Pro will perform against previous dual-GPU cards the company says. The data on this chart is provided by AMD but seems to jive with results we’ve seen in the past. 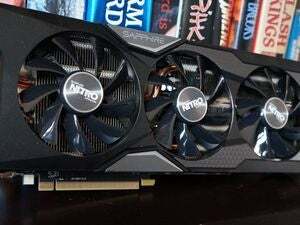 While the Radeon Pro Duo may be the fastest single graphics card when released, it may not enjoy that status for long. Its next-quarter release could mean a debut sometime between April and May. Nvidia has been heavily rumored to be releasing its new Pascal GPU as early as April, at its own GTC conference. Like AMD’s Polaris, Pascal will be a next-generation card built on a 14nm process. If that happens, it’ll be just another volley in the VR graphics wars. Here’s the Radeon Pro Duo at home in a lucious red Main Gear rig.